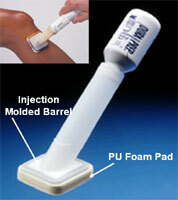 Joining of an open cell PU foam pad to an injection molded PE fluid housing. 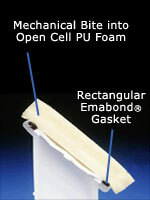 The Emabond� gasket provides a weld to the PE interface while creating a mechanical bond into the open cell structure of PU foam. This medical device is produced using a high-speed automated assembly line. The system is designed to weld 4 applicators per machine cycle.